I actually have an old photo for you this time! 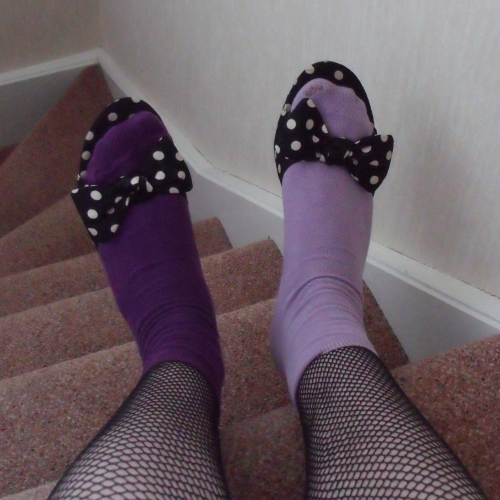 In July 2010 I was unemployed and bored, so obviously I took to wearing strange outfits around the house, and that explains the mismatched socks over fishnets with polka dot shoes. No, I was just being silly and trying to break in these shoes a bit more. I've had them since the last time I went to the USA (they're from a Nine West outlet) which was several years ago now. They're yet another victim of the short, cold, and rainy summers we've had in the UK since 2007. They sit in the back of the wardrobe and when it's warm enough to wear them, I forget I have them. But they are adorable and I love them.